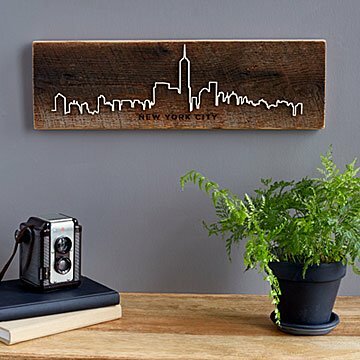 Gaze at your favorite cityscape all year round with this artwork crafted from reclaimed barn wood. It's a myth that we only fall in love with people. We can fall for cities, too. Sisters Melyssa, Michele, and Christine Kirn create a lovely ode to your favorite place with this unique artwork. They take a one-of-a-kind piece of reclaimed barn wood and laser-cut it with the skyline. Next, they laser-etch the name of your city. Give the rustic piece to a homesick loved one so they can gaze at their cherished locale all year round. Handmade in Kentucky. Sisters Melyssa, Michele, and Christine Kirn studied very different things: graphic design, nursing, and architecture. But when it came time to start careers, they decided to come together and pursue a creative path. Today, they run a design company in Kentucky. Each of their pieces aims to turn memories or feelings into tangible products. The women pride themselves on never creating two of the same items. This way, you can enjoy a truly one-of-a-kind piece in your home. The NYC outline does not include the statue of Liberty, â€‹an icon. Beautifully made and ideal gift! Absolutely beautiful, well made and perfect for the person who loves his or her hometown. Our friends absolutely love this gift. The wood and metal meshes with just about any style of decor. This is a great addition to any home!